An insider guide full of time-saving advice and lesser-known, can’t-miss experiences. 101 Disneyland Tips is based on numerous years of visiting Disneyland and experiencing its magic in many forms. This book is not a traditional guide. Instead, it goes beyond the basic information commonly available in other travel guides and websites, and gets straight to what you should know. 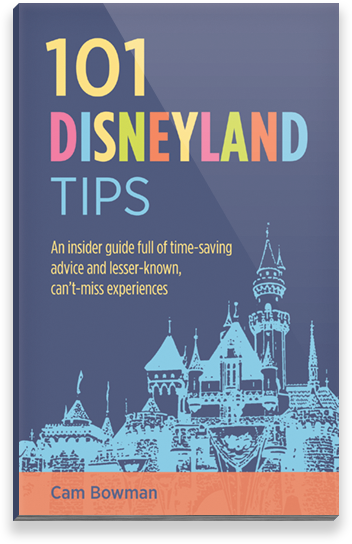 Whether you have one day to spend at Disneyland, or many, the practical, insider advice in this book is packaged into useful tips that can help make your visit less stressful and more enjoyable. With the knowledge Cam openly shares here, you’ll be ready to conquer The Happiest Place on Earth like an informed pro. Now available in paperback. Also for Kindle, iBooks, and all eBook readers.